Laotion (Thai/Viet) Style Sticky Rice, after making sticky rice do you knead the rice in something specific? After removing from the rice cooker the rice is extremely sticky, I remember watching my friend's dad prepare this every morning and he would knead the rice in a substance on the counter top. I believe that it was rice flour. Any ideas on if this is what should be used to knead the rice in? I am not talking about sushi rice. I will make that some other time. I surveyed many recipes available by googling "Loation sticky rice", "Thai sticky rice" and "Viet sticky rice". None of them mentioned kneading anything in after 30 or 40 recipes, although many mention fluffing, folding, or stirring the rice after cooking or steaming to manage the texture. Several did mention that it is appropriate for eating with one's hands. The key may be the variety of rice that is used. Short grained glutinous rice will have the sticky texture desired. Thai people we separate sticky rice on a big round tray after steam it to cool down and get rid of steam heat which will make rice is over cook and become too sticky. If you want to cook from rice cooker soak sticky rice over night and in the morning wash it with water 2-3 times then add water about the same level of sticky rice if you add water too much it will too sticky. Not the answer you're looking for? Browse other questions tagged rice vietnamese-cuisine thai or ask your own question. When making risotto, why fry the rice? What is the best rice for sushi? Do you need a rice cooker to cook sticky rice? How do I make black rice turn out better in a rice cooker? Why don't most non-East Asian varieties of rice stick together? 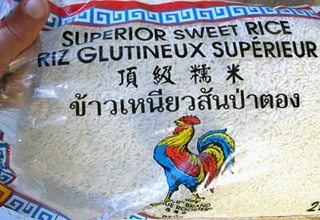 How do I cook sticky rice/glutinous rice in my rice cooker? When spicing rice, should you add the spices in the water beforehand or after the rice has cooked?